The Trevor Athletics Program emphasizes sportsmanship, teamwork, and individual growth. A large percentage of Trevor students participate in our interscholastic athletic program, which complements and enhances their education. Trevor’s passionate coaches, many of whom also teach in the classroom, help impart lessons that are key to athletic participation: self-confidence, cooperation, the power of hard work, and commitment. 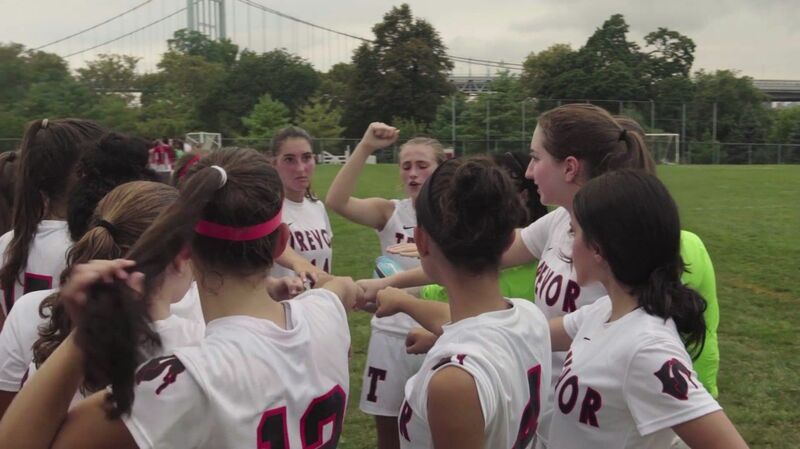 Trevor Day School is a member of the New York City Athletic League (NYCAL), and many of our teams and student-athletes are award-winning competitors at the league, city and state level. Trevor offers eight teams for boys and nine for girls in Middle School. With an innovative PE/Athletics schedule, 75% of Middle School students participated in at least one team in 2016–17. At the Junior Varsity and Varsity levels, Trevor also offers eight teams for boys and nine teams for girls. Fifty-seven percent of Upper School students participated on at least one athletics team in 2016–17. Most teams will have two coaches, however there are instances where that number is adjusted based on the sport and/or enrollment. Each coach is certified by the American Red Cross CPR/AED - Adult plus Child and Infant CPR (or equivalent) and completes the Head's Up Concussion Certification bi-annually. Upper School teams begin their season towards the end of summer in accordance with NYSAIS start dates. It is imperative to begin at this time to allow teams and individuals to achieve the required number of practices before a student-athlete may compete in a scrimmage or contest, as well as to prepare for the highly competitive season to come. Students that miss the start of the fall athletic season will jeopardize their standing on the team and could prevent them from being eligible to participate in scrimmages and contests until the NYSAIS standard is met. Middle School school athletes are not required to attend any practices before the start of the academic school year. Any Middle School athletic practices that take place before the start of school are entirely optional. Below you will find the start dates that have been established as well as the MS and HS Sports Standards. Trevor is a full member in the New York City Athletic League (The NYCAL). The league was established to encourage member schools to improve their extra-curricular athletics programs. Association with a league allows for more consistent scheduling, equalizing competition, conducting league meets, championships and the adherence to league standards and goals. To remain a league member in good standing, schools must adhere to the league’s by laws, rules and regulations. The following schools are members of the NYCAL: The Browning School; The Calhoun School﻿; Columbia Preparatory﻿; The Loyola School; Lycee Francais de New York; St. Hilda's & St. Hugh's School (MS only); Trevor Day School; United Nations International School. Trevor Day is a member in good standing of the New York State Association of Independent Schools Athletic Association (NYSAISAA) that serves as the authority in the supervision and guidance of the interscholastic athletic activities of its member schools in New York State. Trevor elects to join the Federation List, which means we abide by the Commissioner’s Regulation as it pertains to athletics in order to compete with member schools in the NYSPHSAA, CHSAA, and the PSAL and agrees to abide by all the state by-laws, rules and regulations. Trevor promotes good sportsmanship by student-athletes, coaches and spectators. All efforts of the players, coaches and officials should be met by cheering in a positive manner. At no time should spectators speak to participants, coaches or officials while at an athletic event. Any racial/ethnic slurs, personal insults, profanity, fighting or other inappropriate behavior will not be tolerated and are grounds for removal from the site of competition. Games should be competitive but, above all, fun and friendly for everyone. Some athletes use supplements to try and replenish the body. While some supplements might be beneficial, the entire supplement category is NOT REGULATED by the Food and Drug Administration (FDA). Companies are able to put products on the market that could have potential harmful ingredients. The FDA states that the manufacturer is responsible for ensuring the safety of the product, however much of the testing is done by the manufacturer itself not an independent third party. We at Trevor strongly suggest that before any student-athlete puts anything that is unregulated into their body, they consult their doctor. The Athletics Department and it’s coaches are consistently monitoring the weather to ensure that students-athletes are safe. With that said, teams do practice/compete in cold, hot and wet conditions. The school’s full time Athletic Trainer will be in contact with coaches to inform them if a team must stay inside or adjust their practice/contest in any way to ensure the safety of the student-athletes. Coaches also have the ability to adjust their practice at any time, but cannot exceed the restrictions that have been placed by the Certified Athletic Trainer. Trevor adheres to the following guidelines for Wind Chill and Heat Index. In addition, in the event of thunder and/or lightning all outdoor practices/contests will be immediately suspended. When thunder is heard or lightning is seen all athletes, coaches, officials, spectators, etc should immediately seek shelter in either a building or a vehicle with a solid metal top (i.e. car, van, bus). No one shall be permitted to seek shelter under a tree and everyone should stand clear of poles, antennas, towers and underground watering systems. Athletic practices/contests will not resume until 30 minutes after the last boom is heard or strike is seen. Our goal is provide the highest level of medical care to our student athletes. We employ evidence based prevention, treatment and rehabilitation methods for all athletes. Our goal is to return athletes to their sport in the quickest but safest way possible, focusing on student athlete’s health and safety as our top priority. We strive to be role models for the profession and increase awareness of the athletic training profession. The athletic training department is available for the evaluation, treatment, and rehabilitation of Trevor students & athletes. Evaluation & treatment are on a first come- first serve basis, however priority will be given to any emergency injury. The Athletic Training staff is available in the afternoon for rehabilitation and evaluation of injuries, otherwise scheduled privately with the Athletic Trainer. The athletic training room is fully equipped with a variety of taping and custom bracing supplies that can be used prophylactically or as a treatment method of an injury. The athletic training room is fully equipped with many modalities to assist an athlete in injury recovery. A modality is a method, device, or machine that can assist with injury recovery. The athletic training room has a hydrocollator (heat pack machines) to enable student-athletes to have heat therapy. The athletic training room has an ice machine. For all contests taking place at the Upper School Campus, Trevor will supply ice, water, cups, AED’s and crutches as needed. We have two gyms at Trevor Day’s Upper School Campus. The Glenn Markman Gymnasium is our main competition venue with full size basketball and volleyball courts, located on the 3rd floor. Our second gym, located on the 12th floor, has a full size volleyball court and a 72 foot basketball court. Locker rooms and bathrooms are located on the second floor, while the athletic training room is located on 3rd floor opposite the spectator bleachers. Please inform all spectators to bring government issued ID as our Security Staff at the front door requires it. Thank you for visiting Trevor Day’s Upper School Campus. We are located at 312 East 95th Street (between 1st and 2nd avenue). We are short walk away from the Q train (96th and 2nd) and 6 train (96th and Lexington), or a bit of a longer walk from the 4 and 5 trains (86th and Lexington).